Seahawks defensive lineman Quinton Jefferson said Wednesday a crude comment about his mother led to him confronting fans in Jacksonville on Sunday. Seahawks defensive lineman Quinton Jefferson said Wednesday he didn’t hear any racial slurs directed his way from the Jacksonville fans he tried to confront in the stands at the end of Sunday’s 30-24 loss before being led away by team security. But Jefferson said he did hear a vile comment about his mother, which is what he said compelled him to approach the stands. 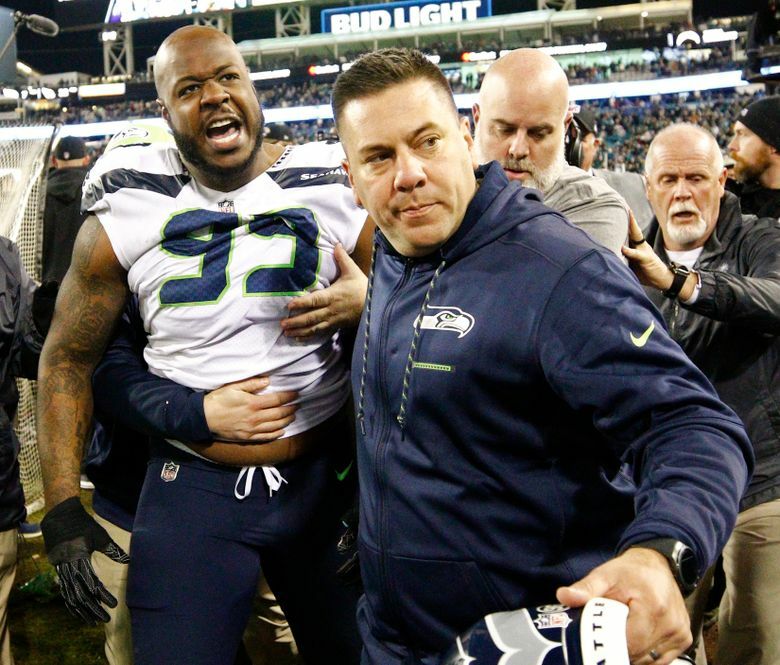 Teammate Jarran Reed tweeted after the game that he heard a racial slur aimed at Jefferson as Jefferson was walking off the field after being ejected in the final minute, and Reed reiterated that on Wednesday. Jefferson, though, said he didn’t specifically recall hearing anything racial. “When the first thing was thrown I went to go confront the guy and he said he was going to (expletive) my mother and all that kind of stuff,” Jefferson said. The second-year defensive lineman said he regretted how far the incident got. But he said he was not surprised that neither he nor any Seattle players would be suspended from the events that arose as a few fights developed as the Seahawks charged the Jacksonville line as the Jaguars were kneeling down to run out the final seconds (though it is expected there will be multiple fines). Jefferson said he watched film of the incident and called it “a little hard” to watch. “It was even worse because my kids have seen it, my wife has seen it,” he said. “She was upset about it and I felt even more upset for them because they had to watch that.” Jefferson, who was a fifth-round pick of the Seahawks in 2016 out of Maryland, and his wife, Zoey, have three daughters. Sunday’s game was just Jefferson’s eighth in the NFL and fifth this season with Seattle after being re-signed in October. He was waived by Seattle on Sept. 2 and claimed by this week’s opponent, the Rams, but never played in a game for Los Angeles before being waived and then re-signed to the Rams’ practice squad. Seattle then re-signed him to help add depth after the loss of Cliff Avril. Jefferson met on Monday with Seahawks coach Pete Carroll who told him the obvious — it wasn’t a good idea to confront fans in the stands.